WINCHESTER, N.H.—It’s an image that’s so powerful, people who’ve never seen the movie still instantly recognize it. The vision of Harold Lloyd hanging from the hands of a clock high above downtown Los Angeles, from the climax of his silent comedy ‘Safety Last,’ (1923), has emerged as a symbol of the “anything goes” spirit of early Hollywood and the magic of the movies. 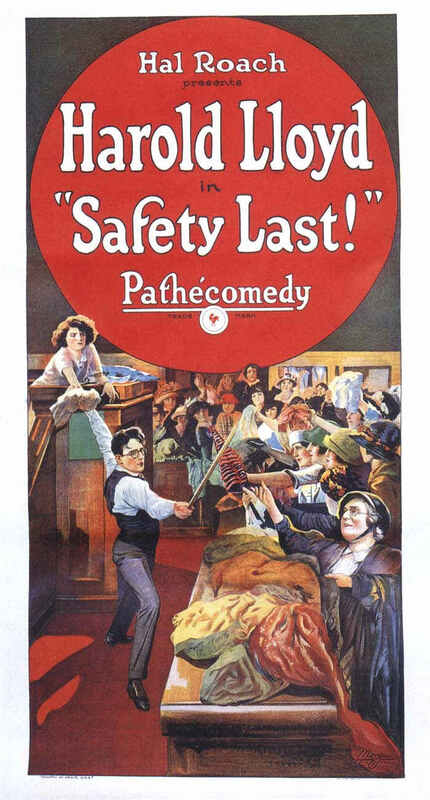 See how Harold gets into his high-altitude predicament in a screening of ‘Safety Last,’ one of Lloyd’s most popular films, on Friday, March 29 at 7 p.m. at Winchester Town Hall, 1 Richmond St., Winchester, N.H. The program, sponsored by the Arlington Grange 139 of Winchester and the Winchester Historical Society, will be accompanied live by silent film musician Jeff Rapsis. The show is open to the public, with an admission of $7 per adult, $3 per child under 12 to help defray costs. Light refreshments will be available for purchase. Lloyd, along with Charlie Chaplin and Buster Keaton, is regarded as one of the silent screen’s three great clowns. Lloyd’s character, a young go-getter ready to struggle to win the day, proved hugely popular in the 1920s. While Chaplin and Keaton were always favored by the critics, Lloyd’s films reigned as the top-grossing comedies throughout the period. However, Lloyd’s public image faded after his retirement in the 1930s, as Lloyd turned his energies to charitable causes such as the Shriners. He retained control over his films, refusing to release them for television and only rarely allowing them to be screened at revivals, fearing modern audiences wouldn’t know how to respond to his work or to silent films in general. Lloyd died in 1971. In recent years, Lloyd’s family has taken steps to restore Harold’s reputation and public image. They’ve released his work on DVD, and arranged for more frequent screenings of his films in the environment for which they were made: in theaters with live music and a large audience. Please come join us for a fun family night, watching a classic movie in the way it was meant to be seen.